We at Oven Cleaning Richmond take pride in the fact that we are among the best professional sanitation contractors that are currently operating in town. By offering a wide range of services that aim at providing all our clients with solutions to problems with sanitation they are having, and doing so on prices that are truly without a match, we manage to stay ahead of the competition. Our fridge cleaning in Richmond service is a clear example of how good we really are – and of the fact that you can count on us one hundred percent no matter what. 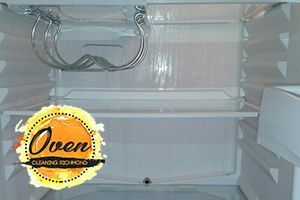 As it is expected, our teams consist of veteran professional cleaners who know every little trick of the trade and would be capable of achieving great results in your fridge sanitation project, without wasting any time or resources. Our technicians are licensed, insured and very capable. They are carefully vetted and very discreet. In short – they are the people that you would want to let clean your home. All methods and equipment employed into the delivery of the top notch Richmond fridge cleaning service we bring to your attention here are a hundred percent eco-friendly. This means not only that we do not use excessive amounts of water and electricity, but also that products containing dangerous chemicals are off limits. Naturally, this is very important for every part of your home, but when it comes to the kitchen, and even more importantly – the fridge – there is really no other feasible way. So, we do not only what is good for the planet, but also what is good for yours and your family’s health. As simple as that. Feel free to sign up for our top notch fridge cleaning service in Richmond right here and now. We have been voted the best professional sanitation company in town by our clients, and you will join the large group of happy customers of our company right away for sure. Make a reservation now via phone or email, and do not hesitate to ask for a free no obligation quote so that you can see exactly how affordable the rates we operate on are.